Chris Pratt and Bryce Dallas Howard will return for 2018's Jurassic World 2. I didn't hate Jurassic World like some other people did. It wasn't anywhere near the film that Jurassic Park was, to be sure, but it was still a lot of fun and delivered some of the finest dinosaurs-eating-people action the cinema's seen in a good long time. Honestly though, what I or the film's detractor think doesn't really matter. What matters is the fact that it made oodles upon oodles of money. Why you ask? Because Hollywood likes money and when it makes a large sum of it, it starts looking for ways to do it again. In the case of Jurassic World for instance, Universal has announced that it will be producing and releasing a sequel flick. 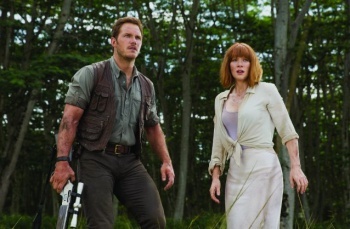 The new movie will see the return of Chris Pratt an Bryce Dallas Howard in the starring roles as well as Colin Trevorrow as its director. Derek Connolly, who did a rewrite for the original film, will handle the script for the sequel which, currently, is just being called Jurassic World 2. Steven Spielberg will also work with the film as its executive producer. The big question, of course, is whether or not it will be able to beat its predecessor's massive profits. Jurassic World raked in more than $614 million in domestic ticket sales alone and would go on to earn more $1.5 billion worldwide. We'll find out if Jurassic World 2 can compare when it starts landing in theaters on June 22nd, 2018.